The Villa Group has been denied a stay order on the tourism ministry’s seizure of two lagoons in a court battle that could bankrupt one of the Maldives’ largest companies. The civil court yesterday rejected a request by Villa, which is owned by opposition Jumhooree Party (JP) leader Gasim Ibrahim, for the stay order, paving the way for the tourism ministry to take control of the lagoons. Villa Group is currently locked in a series of lawsuits against the state over the seizure of several leased properties as well as a notice to pay US$100 million allegedly owed as unpaid rent and fines. The opposition claims the government is unfairly targeting Gasim’s business interests following the JP’s split from the ruling coalition. The government denies any political motivation behind the moves. Villa has filed ten cases at the civil court contesting the tourism ministry’s termination of amended lease agreements as well as the US$100million notice. The company is seeking stay orders halting the enforcement of the notices until the court decides on its legality. But in yesterday’s ruling over the termination of lease agreements for the Maadhihgaru and Kanuhuraa lagoons in Kaafu atoll, the court ruled that Villa Hotels will not suffer “irrevocable losses” if the stay order is not granted as the state could compensate the company if the case is concluded in its favour. The tourism ministry had also terminated lease agreements with Villa for three more islands shortly after the JP formed an alliance with the main opposition Maldivian Democratic Party (MDP) in early February. Requests for stay orders in the other cases are still pending. Former Prosecutor General Ahmed Muiz is representing Villa in the lawsuits against the tourism ministry and the Maldives Inland Revenue Authority (MIRA). MIRA had initially asked Villa to pay US$100million by late March, but extended the period until mid April. Gasim has said the government is planning to freeze Villa’s accounts if the company is unable to pay the amount, warning that it would bankrupt the company and leave his 5,000 employees jobless. In early February, the civil court granted a stay order halting the seizure of the five properties in separate litigation. However, on February 24, the High Court overturned the stay order. Gasim meanwhile met Supreme Court Chief Justice Abdulla Saeed yesterday following the apex court’s refusal to accept an appeal for the High Court decision. Gasim told reporters after the meeting that he expressed displeasure with the Supreme Court registrar rejecting the appeal without offering a reason. The chief justice told him to submit a letter and that matters cannot be settled verbally, Gasim said. The three islands and two lagoons at stake in this case were leased as part of a settlement agreement signed with the government in December 2013 after the Supreme Court ordered the state to pay Villa over US$9 million as compensation. Lagoons are generally leased for purposes of land reclamation for either industrial or tourism purposes. The Civil Court has rejected a defamation case filed on behalf of former Defence Minister Colonel (Retired) Mohamed Nazim against Police Commissioner Hussain Waheed. Briefing the press today on the status of several cases relating to Nazim’s arrest and prosecution on charges of weapons possession, terrorism and treason, Hameed revealed that the Civil Court refused to accept the defamation case on the grounds that the police chief has legal immunity for statements made in his official capacity. Nazim’s lawyers sued Waheed for telling the press on January 29 that an improvised explosive device was found in Nazim’s home. Hameed said at the time that the explosive device had not been found during the initial search, and was not listed in a record of items found, explaining that police only announced its discovery days later after an analysis conducted without independent oversight. The legal team would request a review of the Civil Court registrar’s decision, Hameed told the press today, contending that the immunity was specified in a regulation pre-dating both the 2008 constitution and the Police Act. The legal team was also awaiting replies from the Civil Court regarding lawsuits against Prosecutor General (PG) Muhthaz Muhsin for alleged violations of Nazim’s constitutional rights and “malicious prosecution” of his wife, Afaaf Abdul Majeed. The PG office withdrew charges of weapons possession against Afaaf on February 25. Afaaf has also sued PG Muhsin for defamation. Hameed also revealed that the PG office yesterday declined to provide information requested under the Freedom of Information (FoI) Act. The legal team has subsequently filed a case against the PG office at the Civil Court. The Police Integrity Commission (PIC) has meanwhile met Nazim today to seek a statement for its investigation of a complaint regarding Police Commissioner Hussain Waheed, Hameed noted, adding that the Human Rights Commission of Maldives was also investigating a similar complaint. The legal team also submitted complaints to the PIC regarding the SWAT team involved in the midnight raid, Hameed said, adding that the PIC has said it was in the process of gathering information in response to a separate FoI request. Former Defense Minister Mohamed Nazim’s wife has pressed civil charges against Prosecutor General (PG) Muhthaz Muhsin for “malicious prosecution” over a now withdrawn illegal weapons charge. Afaaf Abdul Majeed and Nazim were summoned to the Criminal Court on February 25 over the discovery of a pistol and three bullets during a police raid on their apartment on January 18. But state prosecutors requested the three judge panel to withdraw charges against Afaaf, claiming documents on a pen drive confiscated along with the weapons had brought to light new information. Speaking to Minivan News today, Afaaf’s family member Ismail Hameed said Muhsin had made an unjust accusation against Afaaf. Her complaint filed under Article 75 of the 1968 Penal Code was submitted to the Civil Court today. Article 75 penalizes unjust accusations made with the intent of harming or hurting an individual with a fine no more than MVR200 (US$13). Afaaf was not aware she was under suspicion for illegal weapons possession until she received the court summons. The police had questioned her only once on the controversial weapons find, her lawyer has previously said. Nazim’s family alleged the weapons were planted in order to frame the then- Defense Minister, a claim the police have denied. Lawyer Maumoon Hameed on Monday said the decision to withdraw charges against Afaaf demonstrated that Muhsin could not be trusted to protect the former Defense Minister’s rights as the accused, including the PG’s constitutional responsibility to asses evidence presented by investigating bodies before pursuing charges and overseeing the legality of preliminary investigations. State prosecutors were also forced to change charges from illegal weapons possession to importing and possessing illegal weapons midway through Monday’s hearing when Hameed pointed out an error in the charge sheet. Further, some of the 13 anonymized police statements presented as witness statements were dated a year back, Hameed contended. The police had also claimed to have discovered an improvised explosive device in the black bag, but had made no mention of it in court, he added. He then asked judges to hold a public and open trial in a larger courtroom to ensure Nazim’s rights are protected. Presiding Judge Abdul Bari Yoosuf refused the request, saying the trial was already public as ten reporters and six members of the public were allowed to observe the trial. The police on February 10 arrested Nazim on additional charges of terrorism and treason, claiming the documents in the pen drive indicated he was plotting to overthrow the government and harm state officials. However, Hameed said the police had not questioned Nazim even once during the 15 day remand. Before the remand expired, the Criminal Court placed Nazim in pre-trial detention until the illegal weapons trial concluded. The High Court today overturned a Civil Court stay order halting the seizure of three islands and two lagoons belonging to the Villa Group, a company owned by Jumhooree Party (JP) Leader Gasim Ibrahim. The Tourism Ministry on February 5 ordered the Villa group to return Thaa Atoll Elaa, Raa Atoll Maanenfushi, Gaafu Dhaal Atoll Gazeera, Kaafu Atoll Maadhihgaru lagoon, and Vaavehdhi lagoon. The islands and lagoons had been granted as compensation for the nationalisation of several development projects, including Kadhdhoo airport. In its February 11 stay order, the Civil Court said the ministry’s termination of the settlement agreement could cause irrevocable damages to the company, and noted the properties had been granted due to the government’s inability to bear the burden of a financial or monetary compensation. However, the High Court ruled that the lower court had not considered protecting the state from potential damages from the stay order. “The interests of the state protected from not issuing the stay order is larger than the interests of Villa Hotels and Resorts”, the High Court ruling said. The Civil Court’s injunction also violated “judicial and legal principles”, the panel of three judges unanimously ruled. The Tourism Ministry’s Senior Legal Officer Faseeh Zahir said the ministry had not yet made any moves following the High Court order as they are yet to receive confirmation from the Attorney General’s Office. Gasim has previously contended the ministry is punishing him for his recent alliance with the opposition Maldivian Democratic Party (MDP) against what they allege to be President Abdulla Yameen’s repeated violations of the constitution. The JP’s opposition to key government legislation last year saw Gasim suffer setbacks to his businesses, as well as physical threats against his person – both of which the party blamed on Gasim’s former political allies. “Forget it, nobody can push us back, we will be in the service of the Maldivian people. 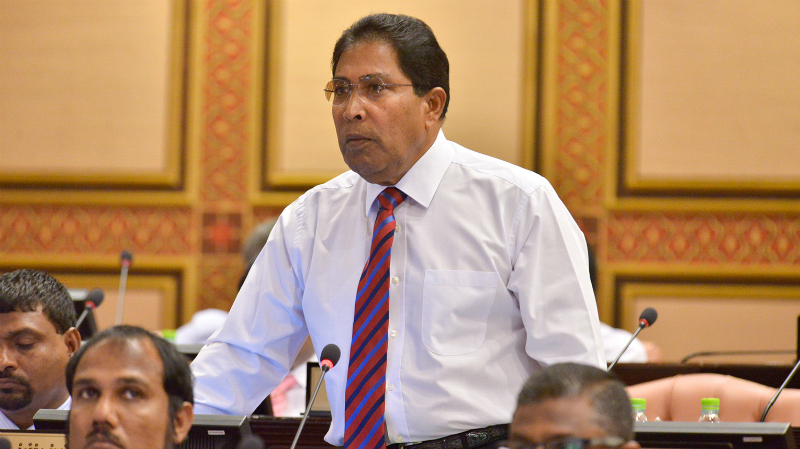 We will defend the fundamental rights and freedoms of the constitution,” Gasim said. “You can seize everything, take it. Take it. After all, things can only be taken from people who have them,” he said. President Abdulla Yameen has denied Gasim’s business reversals were a result of political events, stating that all businesses were treated equally under the law. Meanwhile, the Tourism Minister Ahmed Adeeb claimed the Villa Group owes the government US$100million as rent and fines for properties leased to the company. Gasim has denied the claim and called for Adeeb’s resignation. The Civil Court will halt all trials from February 15 to 19 in order to re-organise the court’s divisions and to settle other administrative matters as ordered by the Supreme Court circular of January 8. Although all trials will come to a stop, the court will continue to accept new cases said a statement on the court’s website. The statement came with a work plan which allocates particular works for every day in the time period including evaluation of issues in the sections, refurnishing, reallocation of responsibilities, and the redesigning of forms and other documentation. “I cannot assure you that I will be sitting on this appeal after the said changes; therefore I cannot give out court summons for the next hearing”. The Civil Court has ordered the Ministry of Tourism halt all proceedings regarding the seizure of uninhabited islands and lagoons granted to Villa Hotels and Resorts Private Limited. According to the order, although the government has said Villa can be compensated for the seizure of the islands and lagoons, the areas were handed over due to the government’s inability to bear the burden of a financial or monetary compensation. The islands and lagoons that had been ordered to be returned are Thaa Atoll Elaa, Raa Atoll Maanenfushi, Gaafu Dhaal Atoll Gazeera, Kaafu Atoll Maadhihgaru lagoon, and Vaavehdhi lagoon. Speaking at a joint rally of JP and Maldivian Democratic Party (MDP), Gasim stated that “the Maldivian people will not allow injustice” and reiterated calls for the charges against MDP leader and former President Mohamed Nasheed to be dropped. “Forget it, nobody can push us back, we will be in the service of the Maldivian people. We will defend the fundamental rights and freedoms of the constitution”, Gasim said. “You can seize everything, take it. Take it. After all, things can only be taken from people who have them,” he told attendees of the joint rally of Maldivian Democratic Party (MDP) and JP held on February 5, 2015.